The bright lights of Las Vegas reveal one of the most famous streets in the world. According to the National Oceanic and Atmospheric Administration, as seen from space, Las Vegas is the brightest city on earth. Located in an arid desert basin surrounded by mountains, Las Vegas is the largest city in Nevada. The Las Vegas Strip, otherwise known as Las Vegas Boulevard South, is known for its large, luxurious hotels and casinos. The nightlife in Las Vegas is legendary, including Broadway plays, stage shows, casino gambling, restaurants, dancing, shopping and entertainment. With over 30 million tourist visits annually, Las Vegas is among the most popular travel destinations in the United States. 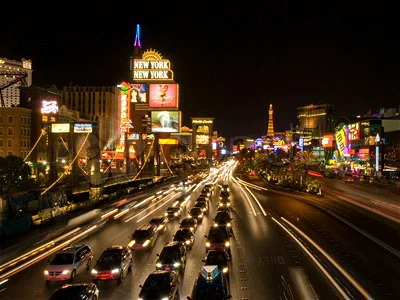 Hotels and Casinos on the Las Vegas Strip, include the Aladdin, Paris, Bellagio, Rio, Tropicana, Mirage, Harrahs, Caesars Palace, Ballys, Riviera, Stratosphere, Palms, Sahara, Treasure Island, Flamingo, MGM Grand, Venetian, Monte Carlo, Excalibur, Luxor, Royale Palazzo, Wynn and New York New York. See our other images for more on this subject and other formats of this video.